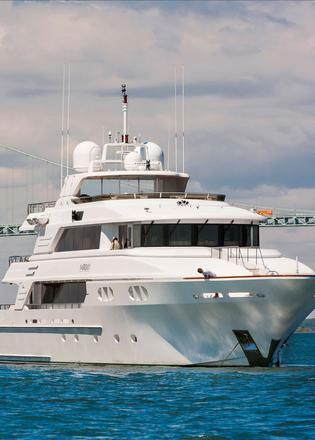 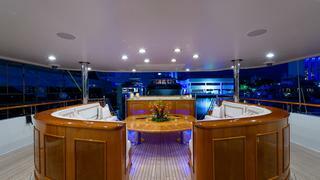 The large covered aft deck is entered from port or starboard side boarding gates, via a Marquipt tide ride ladder. 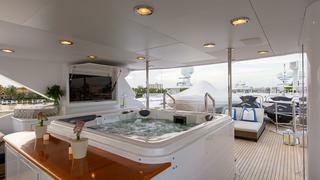 One may also board through the midship boarding gate, or onto the swim platform using the 20’ Bezenzoni passarelle. 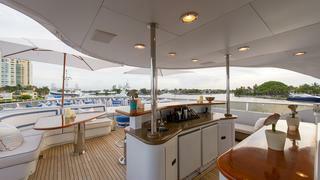 The main aft deck has plenty of seating with one large high-low custom teak table that converts to either a dining table or a cocktail table. 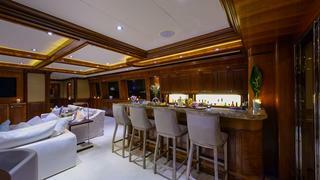 There are a beautiful teak and granite refreshment bar complete with ice maker, refrigerator and flip down 50" LCD TV. 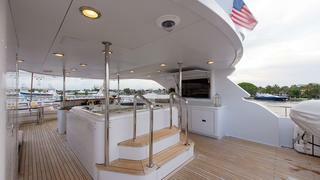 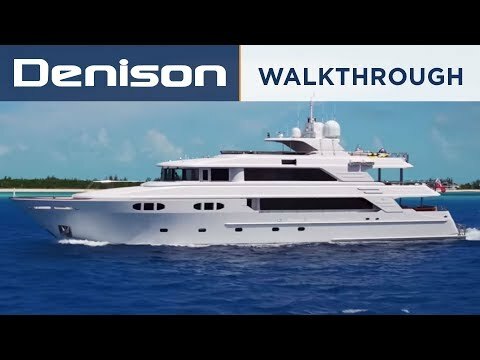 There is access to the upper aft deck, via a stairwell to port, or forward to the salon through a powered stainless and glass door. 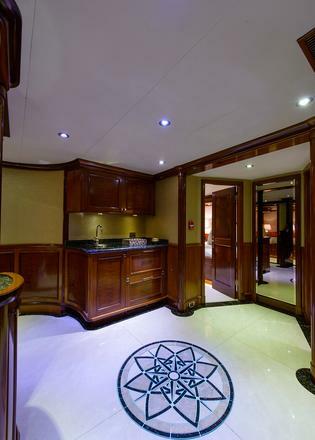 As you enter the salon from the aft deck, through the custom built stainless steel automatic sliding doors, you will find an elegant and stylish lounge for entertaining guests. 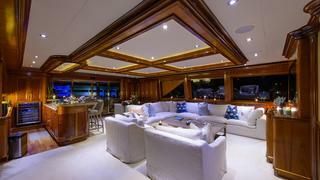 The seating area includes two large custom sofas, two matching white armchairs, a side table and cocktail table. 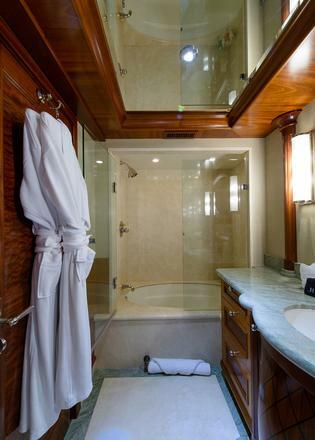 The drapes are electrically powered, the ceiling is coffered, and illuminated by a custom etched glass compass rose. 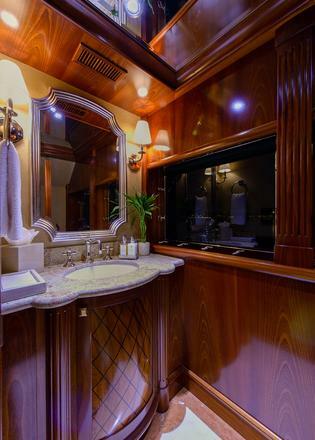 The entertainment center that separates the salon from the formal dining room includes a fixed 52' LCD TV, Denon tuner/amplifier, DVD player, media music center and Satellite Receiver. 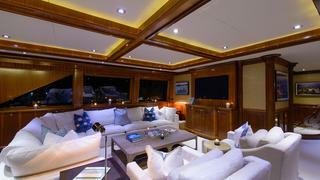 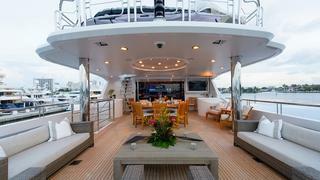 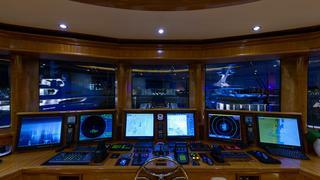 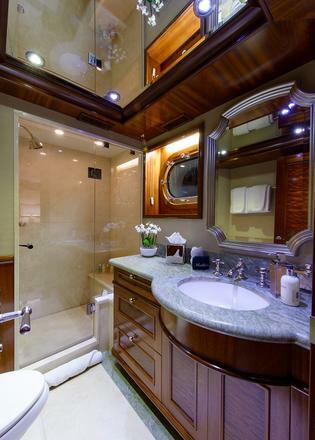 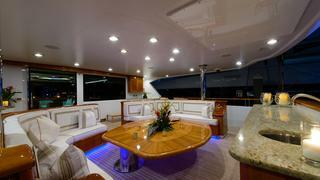 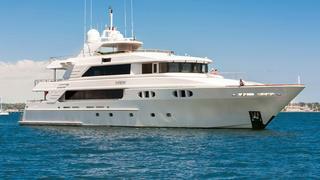 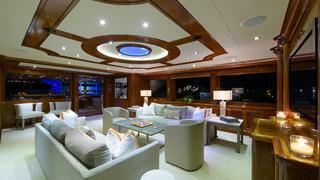 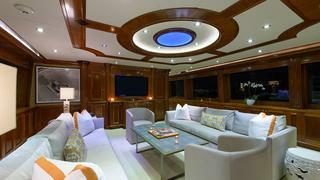 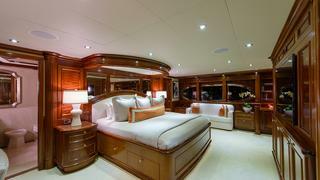 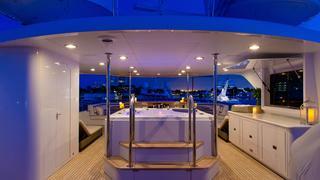 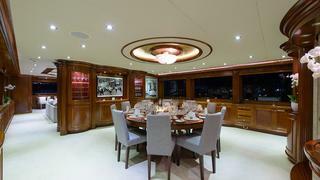 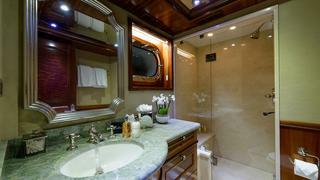 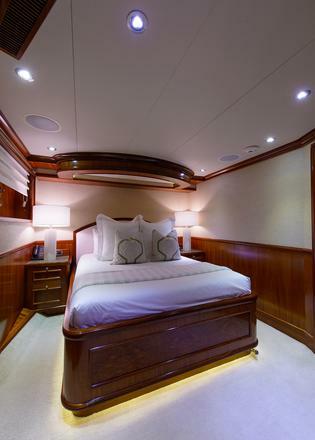 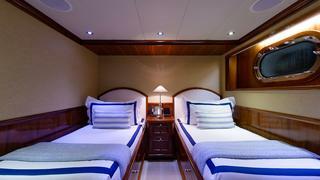 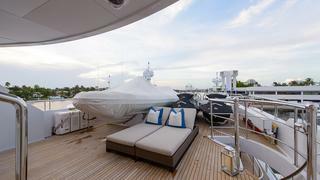 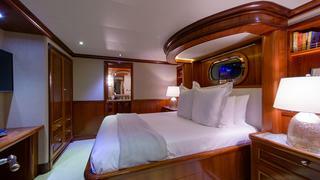 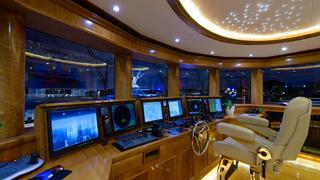 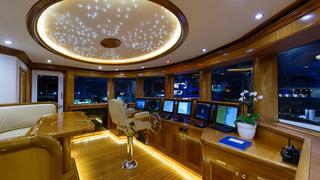 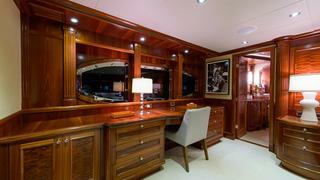 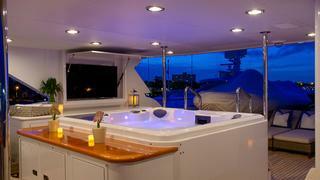 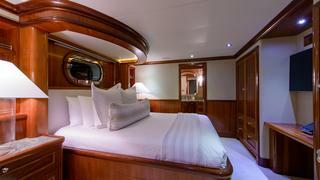 Forward of the salon, in the center of the yacht, with great visibility, is a spacious formal dining salon. 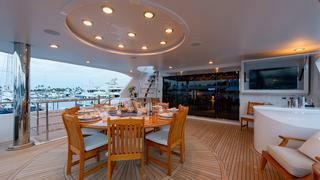 It is one of three places to dine on the yacht. 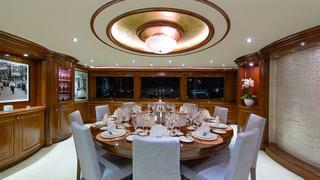 It features a custom round mahogany dining table capable of seating ten guests, with plenty of natural light through the large side windows. 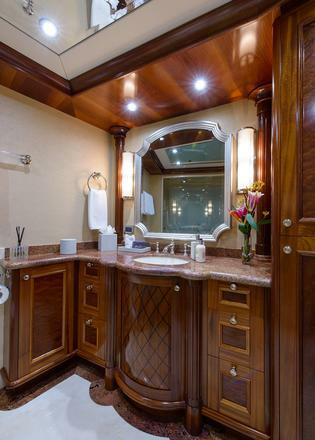 The galley, located forward to port of the dining salon, may also be accessed from the midship port side deck for ease of crew access and stocking galley supplies. 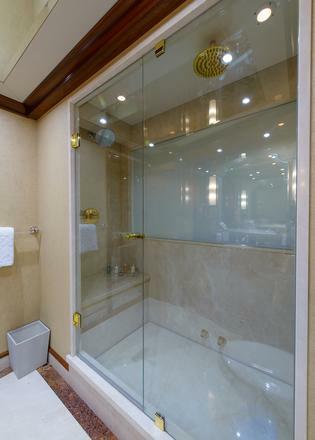 As you enter the butler's pantry from the salon, you will find an ice machine and dishwasher. 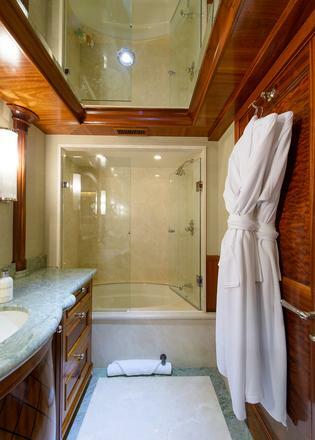 All appliances in the galley are stainless steel units including (2) large side by side Subzero refrigerators, trash compactor, steamer oven, dishwashers, (2) drawer freezer, cook top and (2) double wall ovens and a microwave.